Few plants garner the cult following of Deppea splendens, the magnificent cloud forest plant that’s probably launched more insane bidding wars on ebay than any other. It’s almost iridescent leaves & delicate gold & maroon blooms suspended daintily from filament-like pedicels make a late Summer & Fall display that knocks some serious socks off. Discovered & named in 1972 & the original collection was made by Dr. Dennis Breedlove in 1981 near Chiapas, Mexico. On a return visit in 1986, the canyon where the original plants were discovered had been razed & converted to farmland. There was no trace. It’s now presumed to be extinct in the wild, though there is more than one clone in cultivation today. 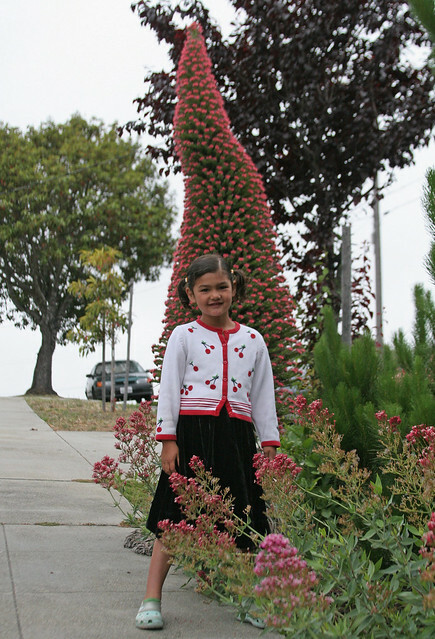 Ours came from Strybing Botanical Arboretum in San Francisco, where the plant thrives. Those cool, foggy Summers are the perfect thing for a cloud forest dwelling rarity & keep its leaves lush & emerald green. For many years the availability of this exquisitely rare plant has been scarce, but this year we have enough to not only offer it, but FEATURE it in our brand new and super pretty Summer catalog! Making a place for the plant in your own home garden can’t bring back what has been lost in the wild, but it can help encourage awareness of rare & endangered plants & ethics aside: aesthetics, folks – this plant is mad pretty. Who wouldn’t want to have a specimen of such copious beauty close to their domicile? Not all endangered plants are pretty, you know. I won’t go naming names because that’s just not nice. What you need to know in order to get your Deppea to grow? Keep it out of the hot hot heat, please – your plant will sulk, drop leaves & generally pitch a fit. It can take a fair amount of direct light, but with too much sizzle you’ll find yourself the accidental killer of an extinct plant (which, really – no pressure. You’re not necessarily responsibly for the development that got it into this rarified position. Don’t fret.) Too much cold is a sure fire killer, too. Protect from all but the lightest frosts, or bring the plant in under cover. Our plants in the nursery are currently growing in 10-20 gallon pots and are doin’ fiiiine. Heavy soils are ill advised, so amend for drainage & mound the soil up a leeetle bit. Average water should suffice, or regular if you’re somewhere with extremes less gentle than those of the Bay Area. This plant is a challenge. That much is true. It’s also more & more rewarding as it thrives & ages, with ever-heavier clusters of flowers & a beautiful form. When well grown, it can eventually be shaped to look like an elegant multi-branched tree. In cultivation it will achieve around 8+ feet in height (though it’s often much shorter) & stays more tall than wide – 4’ or so, but pruning will ultimately determine the plant’s footprint. P.S. (Once more with feeling) have you seen the shiny new Summer catalog? It’s super swell! 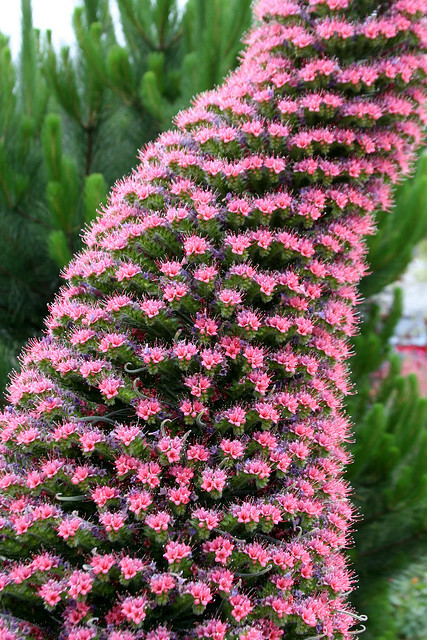 We’ve been growing Echium wildpretii for over 15 years and consider it an old friend, but somehow this 6-8’ tall pyramid of flowers never ceases to drop our jaws. Even though it’s got a spectacularity rating of 10, it’s a 1 on the simple-to-grow scale. In its first year, plant it out in a sunny to partly shaded site (most soils except the soggiest are perfectly fine) and wait. Year one, it will make a pretty but understated rosette of leaves. After its first winter is when the plants will go up up up! 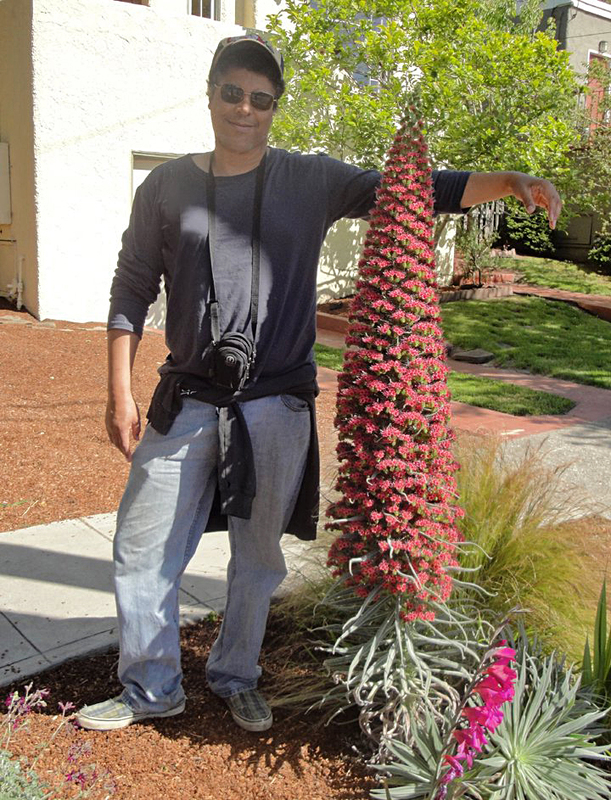 Our buddy Les and his best triffid Buddy in Berkeley, CA. When we say that this plant can stop traffic, we mean it!! Bees and hummingbirds far and wide start circling in when it starts to bloom, but so do cars! If your Echium can be seen from the street, expect some curious visitors. Carri from Sacramento looks a little bit dubious about getting snuggly. 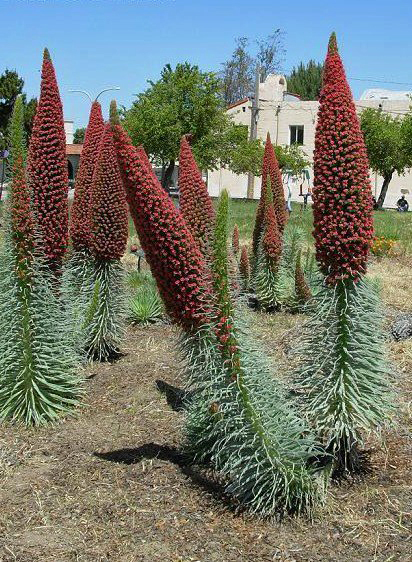 Carri’s curbside Echiums have brought MANY people to her door. How many? Well, let’s just say that her husband is petitioning to install a sign out front to stop the friendly interruptions. WHERE DID YOU FIND SUCH A THING? Well, at Annie’s Annuals & Perennials, of course! 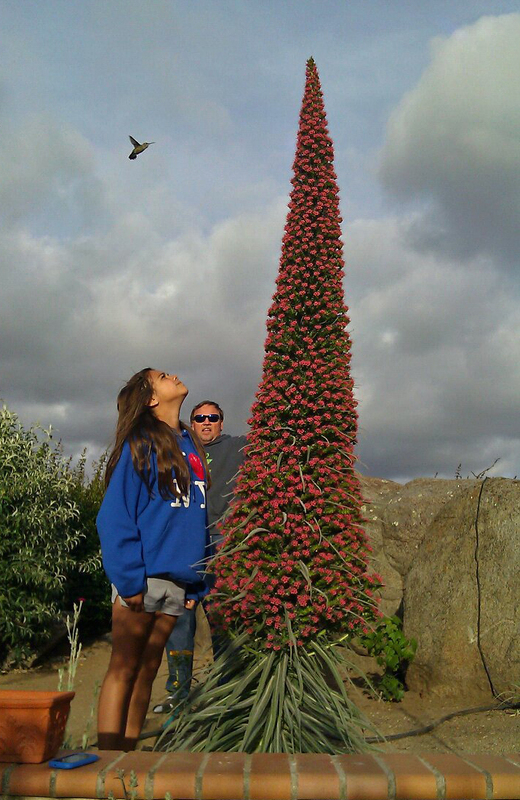 John from Downey, CA got this Echium for his birthday last year. Watch out for the hummingbirds - they don't like to share! “Tower of Jewels” is the common name for E.wildprettii, but it could just as easily be called “Tower of Bees” or “Tower of Hummingbirds.” It does a magnificent job of advertising its wares and the payoff is HEE-UGE! Alex - Queen of the Jungle! Everyone reach for the sky! Rough soil? Harsh site? Full, baking sun? Echiums don’t care! See below: this gaggle seems perfectly at ease on a vacant lot. 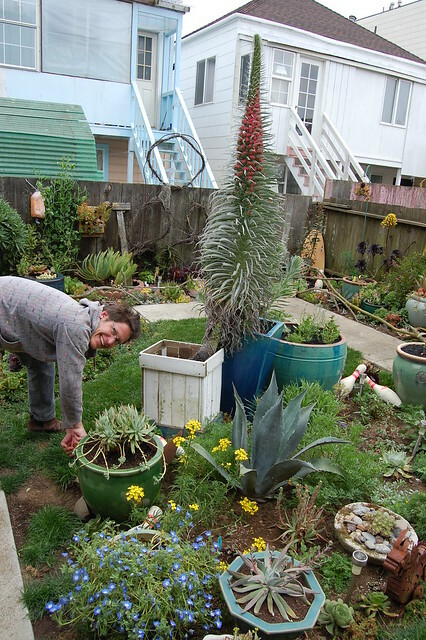 Glenn Park posted this photo of E. wildprettii growing happily in an empty lot in Lompoc, CA. 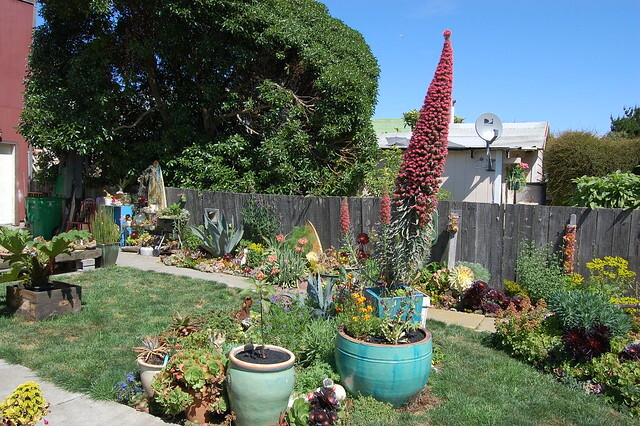 Pots are also *generally* a no-no (a confined space makes Echiums suffer and sometimes go kaput) BUT we’ve now had a number of experimental gardeners prove to us that it *can* be pulled off. If you try it, a big container is prefereable. 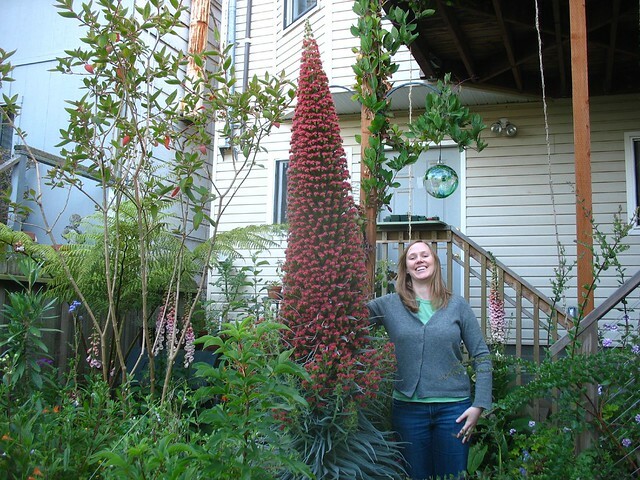 Megan and Matti from the Far Out Flora blog grew their Echium in a pot, and lo! It did just fine. 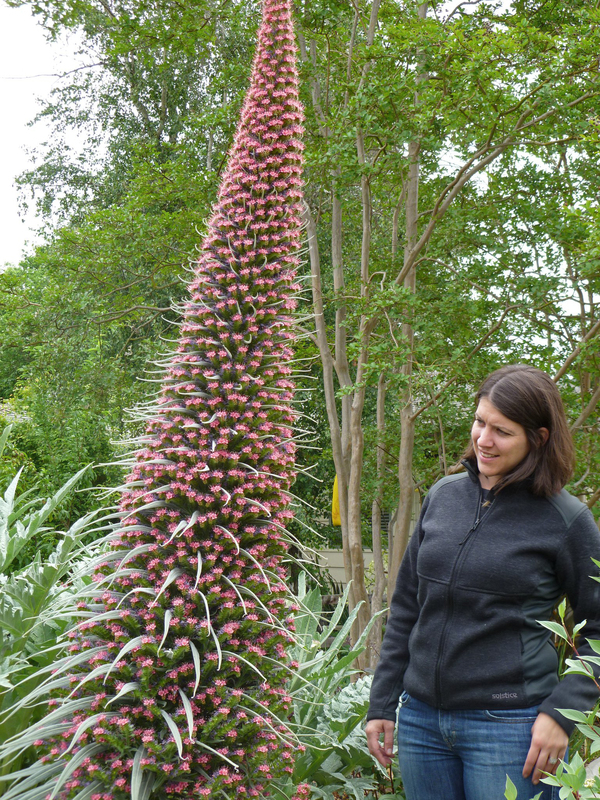 Megan from Far Out Flora suspects that their amazing specimen might be growing through the bottom of the pot, but even so, it seems like containers (BIG CONTAINERS) are worth a try – especially if it’s the ONLY way you zonal denial folks can make your Echium dreams come true. Master mugger Matti for scale. After blooming, these towers of loveliness will pass on into the great garden in the sky BUT they almost always leave behind a few seedlings to carry on another day. If you must relocate the babies, do it quickly when they are still very small. 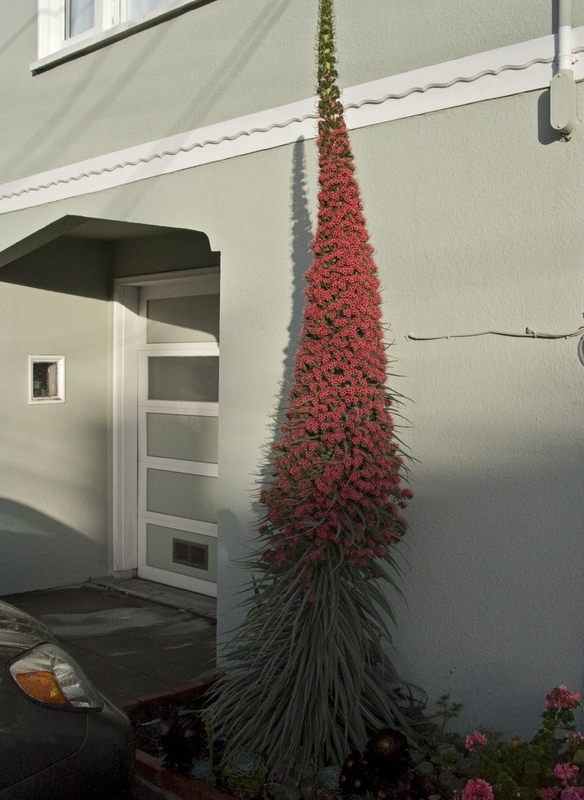 Eunice in San Francisco attributes her Echium's vim and vigor to a bucketful of mop water (no soap) every other week and plenty of sun. 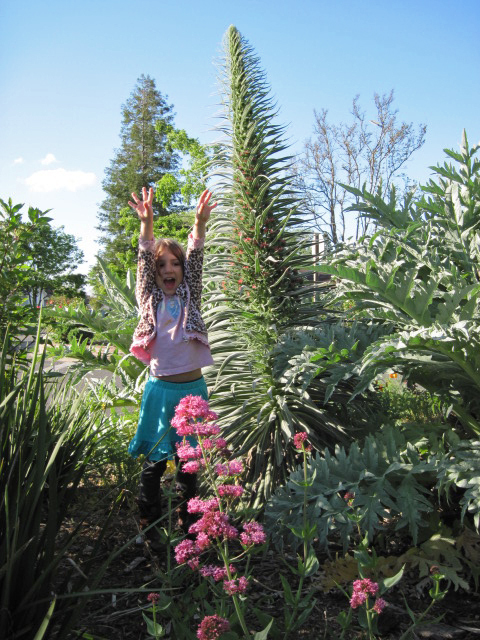 Are your Echiums in action? Post it to our Facebook page! Special points for dressing it up in a baseball cap and sunglasses, giving it a moustache or maybe a Hawaaian shirt. We’d be all for that. Echiums, away!! What in the world has happened to garden center plants, people? Sunflowers and Asters in bloom at only 4” tall? Nicotianas with no scent and Dianthus that die a month or less after planting? Yes dear gardeners, this nasty trend which started more than 10 years ago is accelerating quicker than you can squash a bug. 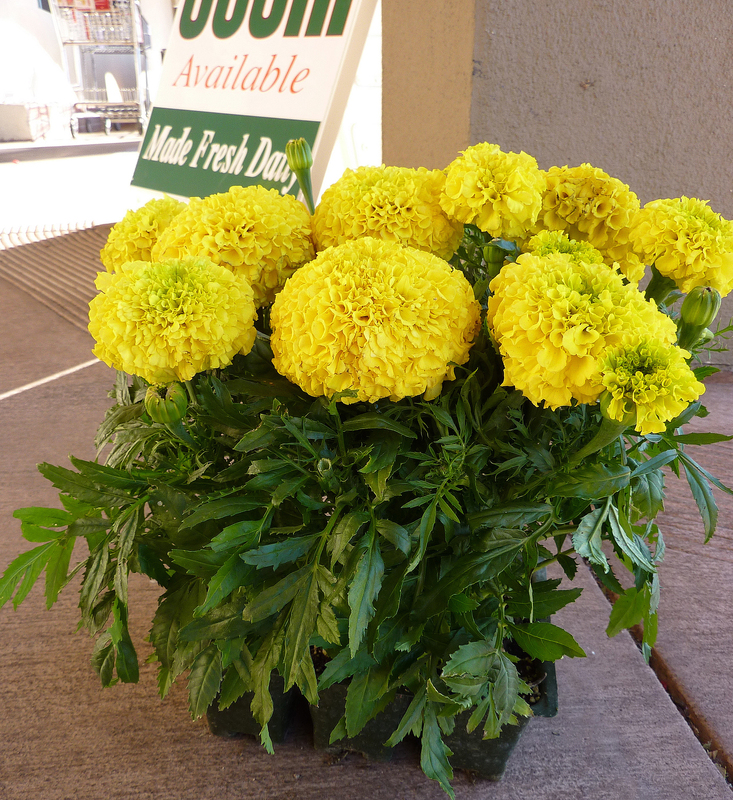 Last February, in front of my neighborhood supermarket, I felt super horrified as I noticed the African Marigolds on display by the front door. They were in full bloom (in 6 packs!) at no more than 5” tall. Gadzooks! Ahhh, that's better. 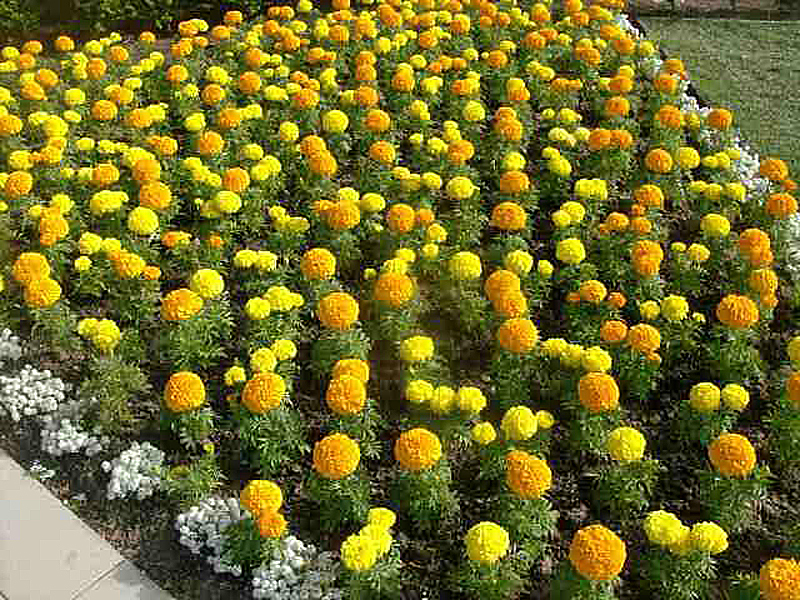 Day of the Dead Marigolds growing to a proper 3' tall. 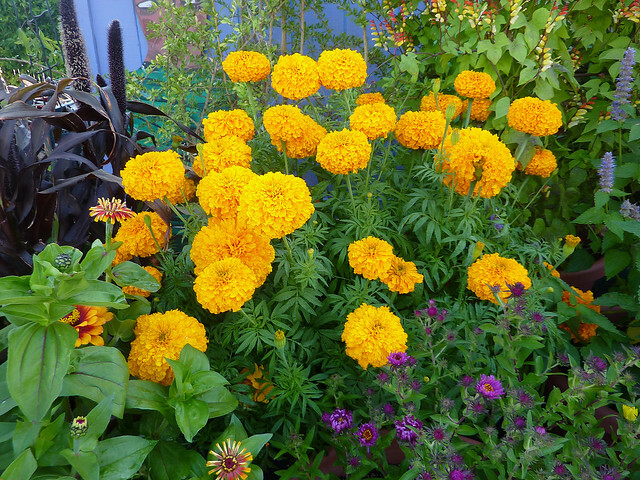 African Marigolds are supposed to be huge. To 3 or more feet tall and 3 feet across. If you’re a young gardener, you may not even remember them being so grand and fabulous with their bushy multi-branching form and loads of 4”-across, extra double, dense blooms fantastic for cutting. 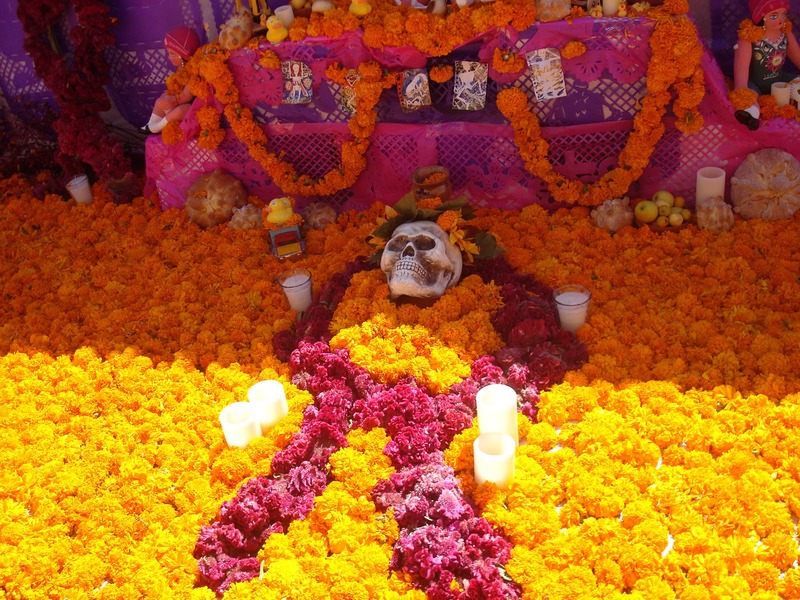 Here at the nursery we call them “Day of the Dead Marigolds” as they are still grown in Mexico and South America to create altars and stunning displays for the holiday. So you can imagine my chagrin to see what the nursery industry has done to them, all in the name of being able to serve the customer what they say we want – 6 packs and 4″ pots in full bloom. And for heaven’s sake it was February ! Umm … freezing! Obviously, they were greenhouse grown, so now you can watch them die in your yard from the cold which they are so not fond of. I know that “each to his own” and I’m glad when anybody gets outside and digs their hands in the earth, but don’t you think it’s sad that taller varieties, with all their grace, lovely form and charm are being pushed out (and forgotten), only to be replaced with squat, charmless blobs of color? What can you do with them? Line them up like orange and yellow tennis balls just like at the gas station? Nice. What can we say? We have no words. More and more plants are being sold all dwarfed and squatty. Many of our seed sources are dropping the taller varieties across the board and it has become harder and harder to find original proper sized species. Wait a minute, what's going on here?! Okay, you gotta give the person who designed this carpet bedding some points here for being creative with what they had to work with. But wouldn’t you prefer your Ageratums to look like this? Ageratum houstonianum growing to its rightful height of 3 feet. 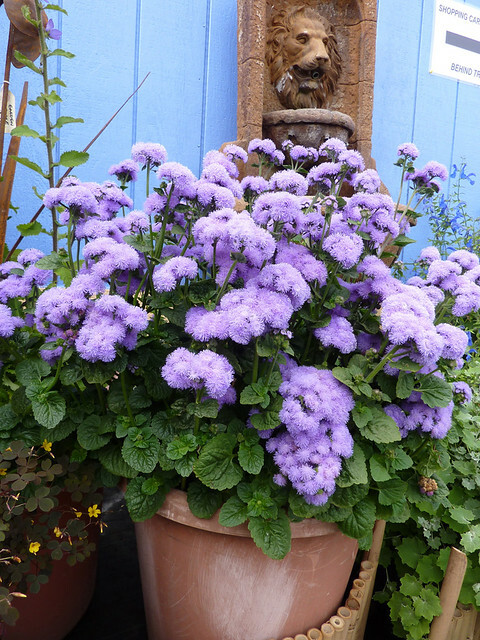 To 3’ tall and 30” across, Ageratum houstonianum ‘Blue Horizon’ has big, fluffy, butterfly enticing, sweetly scented flower clusters – great for cutting. That’s a 15 gallon pot you see here and those blooms lasted for months. When dead headed they go on blooming all summer! That’s another big problem with those boinky dwarf plants. The bloom time is very short, especially when they’ve been blooming at the growers and then at the garden center before someone comes along to buy them. Okay, one last depressing example. Dianthus. 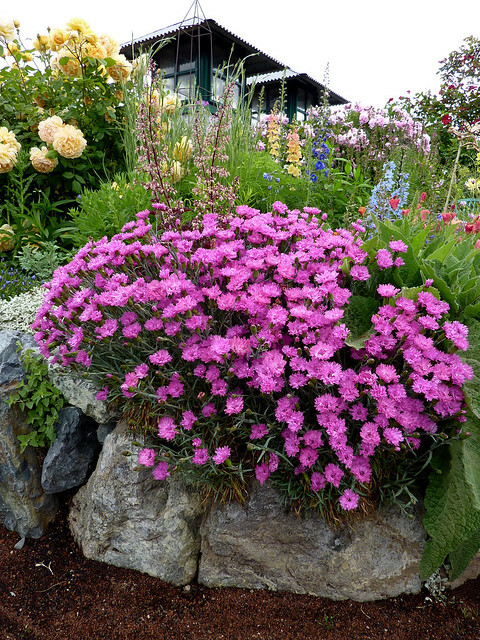 Dianthus is one of my all time favorite, awesome and reliable perennial standbys. They’re in full bloom in my back yard and at the nursery right now and they are really, really showy. They totally make my gardens pop with their profuse bloom and romantic colors and fragrance. Dianthus 'Pinkerton' blooming its heart out at the nursery. 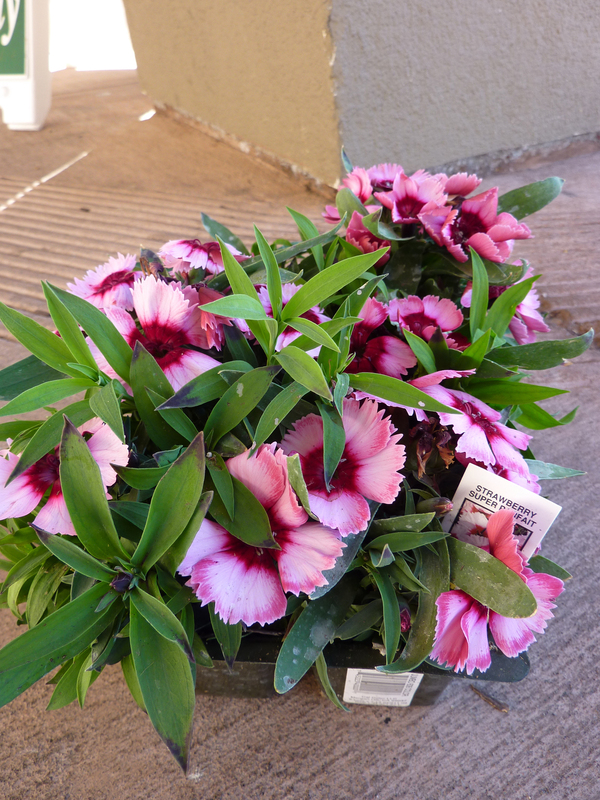 These are Dianthus sinensis. Squat, die-pretty-darn-fast, scentless and disappointing annuals (which are often sold as perennials!). They grow to 6” tall at best. You’ll never see them bloom like the one plant of Dianthus plumarius ‘Pinkerton.” Nowadays, I’m afraid a lot of folks think I’m delusional when I tell them how much I love my Dianthus. Our beloved “Pinks,” (Dianthus plumarius and D. gratianopolitanus) are one of the oldest of all cultivated perennial plants and they are in danger of becoming so obscure and hard to find that they may soon be banished to garden memory oblivion. It makes me sad that up and coming young gardeners may never discover how great they are. 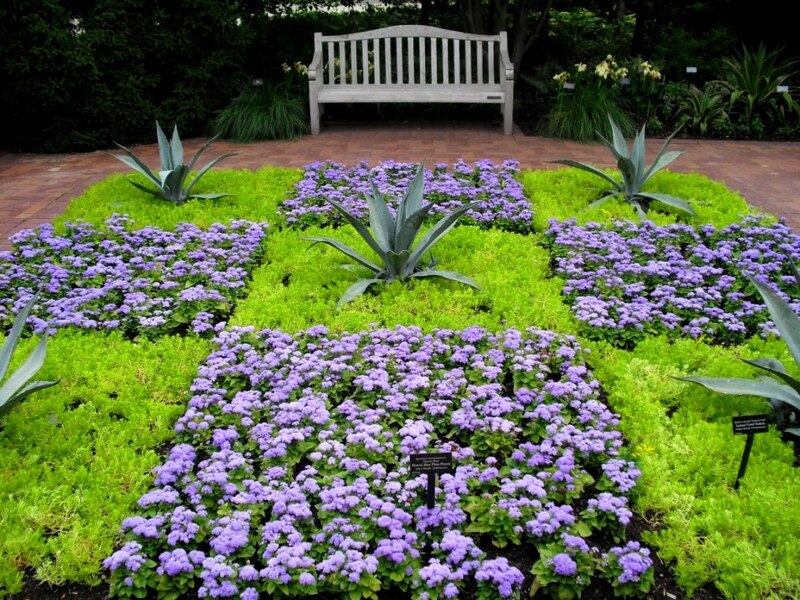 Lastly, a great garden includes plants of varying heights, forms and textures, of course. But with these “box store” offerings, everything ends up being the same size! Well, that’s not very fun. And I don’t think it’s as aesthetically pleasing – or rewarding enough – to really draw folks into the wonders of gardening. In honor of Amy Stewart – author of “Wicked Plants” – and her free talk at the nursery on Sunday, April 10 at 11 am – we present you with the most terrifying plant in our arsenal: Mandragora. Have you ever played Bloody Mary? I don’t mean the drink – I mean the “game” where you attempt to conjure up a ghost in the bathroom mirror. Turn around three times and say her name (BloodyMaryBloodyMaryBloodyMary) just to see if she appears? Well, Bloody Mary was certainly a well-worn part of my late-night slumber party experience as a kid and the result was consistently the same – we were never able to conjure the ghost, but we were certainly able to scare ourselves silly. For the first time in my adult life I’ve found myself in a similar predicament and this time, it’s with a plant. A plant that can kill you. With its screams. From the ground up, a mandrake is a most unassuming plant. It makes a big, leafy green rosette with pretty purple flowers nestled close at the center. It’s what’s underground that’s so sought after and so perturbing. The roots, which can get a few feet long, are like a carrot grown in rocky soil – twisted and thick, and bear some resemblance to a wrinkled little man. The plant is used in magic and in ritual, and there are certain things you must do in order to harvest it correctly. During the Middle Ages, often the harvester would tie a dog to the plant and then leave and go very very far away, so that when the dog pulled it free and the plant’s deadly screams (YES SCREAMS) hit the air, the dog would be the only victim. Being a dog owner and animal lover, I sort of have a problem with this method, but I am also hoping that even if it’s true that people did this, no dogs were harmed in the process. Regardless, the screaming has me nervous. I’m sort of relieved that my handling of the plant has been in its care and not in its transplanting. I did warn Jen, who transplanted them when it came time, of the risks involved. Jen’s okay, by the way. She transplanted the Mandrakes a few months ago and I just saw her today. She reports no ill effects. The humanoid appearance of the plant is part of what makes it so feared, but the contents of the plant are a different kind of scary – all parts are poisonous and contain potent compounds with hallucinogenic and depressive effects. This should go without saying, but I’ll say it anyways – our interest in the plant is as curiosity, not medicine. Ingesting any part of a plant as poisonous as this one is a dangerous and stupid idea. But as plant geeks? You bet we’re hooked. This is one symbolically heavy plant! 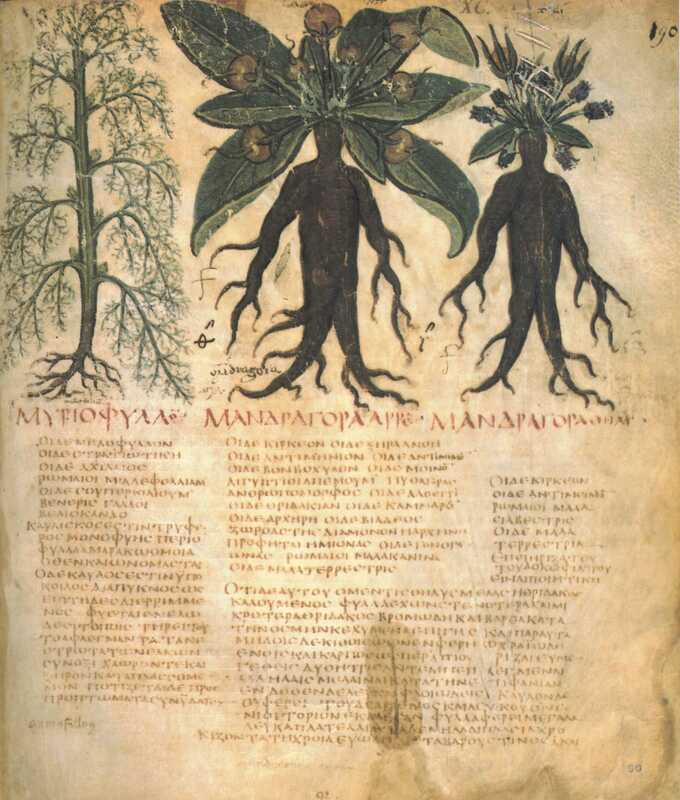 Mandrakes, male and female, from the Neapolitanus Dioscurides manuscript, Biblioteca Nazionale di Napoli, early seventh century. So no one’s died yet – no dogs, no coworkers and not me, as I sit here writing this in the office, with a great distance between me and the spooky roots. We have just a few plants for those brave enough to keep their company. They’re growing innocently in clay pots in the back of the nursery, and I am watching them carefully. Very, very carefully. The species we’re growing isn’t the infamous Mandragora officinarum, either. 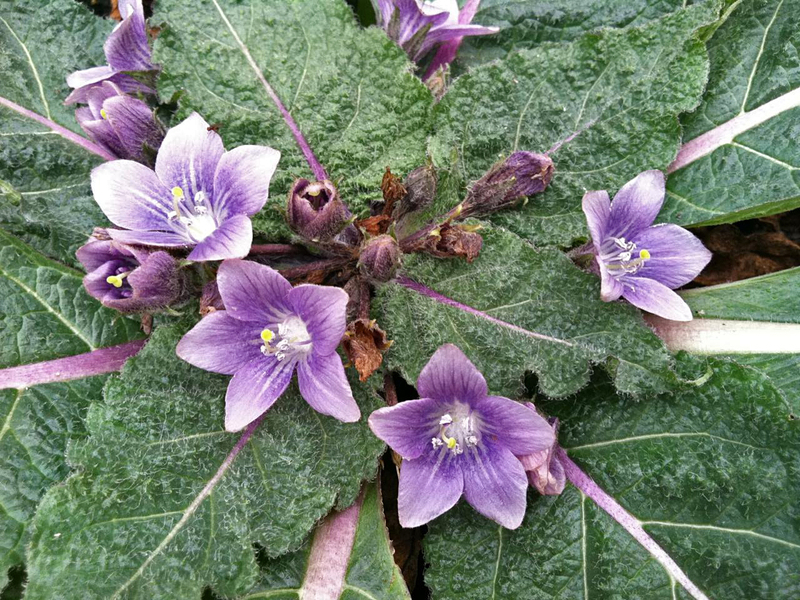 It’s the rare and endangered Mandragora turcomanica from Iran – READ ALL ABOUT IT HERE. Perhaps we’ve been safe because we’re not growing THE Mandrake, we’re just growing A mandrake, but I’m going to guess that it might also be because we’re giving this fascinating plant the respect and reverence it deserves. 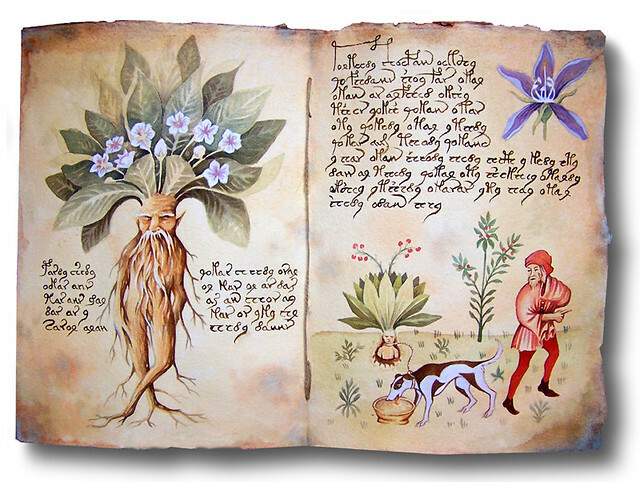 If you’re keen on learning more about the mandrake and other plants with seriously wicked potential, then you MUST read Amy Stewart’s book Wicked Plants: The Weed That Killed Lincoln’s Mother and other Botanical Atrocities. And get thee to the nursery this weekend! Amy’s giving a talk on Sunday, April 10 at 11 am and it’s sure to be spooky stuff.